On 23 January, 2018, the World Economic Forum (WEF) commenced its 48th World Economic Forum Annual Meeting accordingly themed ‘Creating a Shared Future in a Fractured World’ in Davos, Switzerland. As has been the case for past meetings, business leaders, international political heads, and economists gathered together to tackle the world’s most pressing issues of the past year, in order to improve the state of the world. As the focus stands and continually remains, greater economic interdependence among countries, and its accompanying peace and stability, is the ultimate goal moving forward. The agendas that have been reviewed during the conference can be split categorically into their various different focus points and contextuality. Simply put, issues are divided into areas of political, economic, and social perspectives. Some of the multiple agendas tackled were the Global Agenda, the Economic Agenda, and the Future Agenda. The global agenda revolved around the idea that improving public-private sector cooperation through international organizations also improves relationships. Under this section are issues pertaining to global trade, such as the North American Free Trade Agreement (NAFTA), the possibility of a trade war, and the completion of the Comprehensive and Progressive Agreement for Trans-Pacific Partnership (CPTPP). From the economic perspective and agenda were issues surrounding development, such as how the International Monetary Fund (IMF) raised its global growth forecasts for 2018 and 2019 to 3.9%, on the back of trade and US tax reform. Policies were also discussed that focused on sustainable development, and the growth expected from a Fourth Industrial Revolution which includes rapid advances of technology in artificial intelligence and cryptocurrency. Ultimately, the Future Agenda dictates sharing of ideas and innovations aimed at the reshaping the global systems and next generation of leaders. Under this agenda were the social issues of women’s rights in positions of power and the timely #MeToo and Time’s Up movements were addressed. In the narrative of global trade this past year,, an overwhelming wave of concern came as a result of the Trump administration and its actions. Whether this is from Trump’s America First rhetoric alone or from the direct actions committed under his presidency, easily the most widely-anticipated moment of the conference revolved around the US President’s speech. One integral part of the narrative, of course, was the seemingly inevitable death of NAFTA. From as early on as his campaign days, Trump has expressed clear discontent about the trade deal. On 29 April, 2017, in fact, an executive order was mere moments away from being signed, formally retracting the US from the trilateral deal. Fortunately, due to significant meetings with Canada and Mexico,, he decided to entertain the possibility of renegotiation. As a result from several rounds of negotiation meetings, it has become evident that changing the deal is a much more realistic possibility for all parties involved. As Ildefonso Guajardo Villarreal of the the Secretariat of the Economy of Mexico said, "NAFTA is 22 years old. We need to modernize it." He added that “the car [we] use as the base for rules of origin is the model from 1991. Look at the car today - it’s 80 percent different.” This recognition of unfair trade and predatory practice, if anything, was a good sign that an American departure from the deal is preventable. Trump’s message at the conference reflected the idea that the America First agenda was beneficial to the world, claiming, “When the United States grows, so does the world.” And while the US has not pulled out of the trade deal, Trump’s claims during the conference revealed the US sentiment to enforce trade laws and restore fair and reciprocal integrity to the trading system by imposing tariffs on imported washing machines and solar panels. These claims evidently prompted concern from China, whose trading interest with the US has led to fears of a possible trade war. Jack Ma, CEO of Chinese retail giant Alibaba, added that “if trade stops, war starts.” Although tension from the possible ramifications of the US action on global trade was a focal point of the conference, the completion of the new CPTPP was equally significant. Almost a year since Donald Trump formally pulled out of the Trans-Pacific-Partnership, Canadian Prime Minister Justin Trudeau began his speech with the announcement that Canada and the 10 other remaining members of the TPP had concluded negotiations on a new and refined deal successfully. Throughout his speech, trade talks were a magnified subject, not only exemplified by the relatively slow but work-in-progress NAFTA renegotiations, but also in the anticipated success of the historic trade deal completed in the CPTPP. What this trade deal added aside from the benefits of shaping the global trade environment was to set up new rules for labour rights and and environmental standards. The goals of the refined deal were specifically designed to combat the idea that trade benefits the elites more than anyone, by ensuring that the working people were being rewarded aptly. As Sharan Burrow, head of the International Trade Union, put it, “The model of globalization has failed working people. Eighty-five percent of people in our polls say they want to rewrite the rules of global trade.” As part of her argument, she called for a “new social contract” that would give better protection to workers and give an ability to unionize. In line with the new rights provided by the CPTPP, achieving the desired widespread benefits of trade can objectively be considered a step closer, thanks in part to this deal. Although Trump’s platform of tax reform contributes to the predicted global economic growth from what has been a slump in the recent past, it has been stated how in the long-term these effects are not expected to hold. The US tax policy changes, as the International Monetary Fund (IMF) reports, are are expected to stimulate activity; the boost will mostly be driven by the investment response to corporate income tax cuts. From 2022 onwards, in fact, growth is projected to decline from the effects of the tax policy package. Though temporary growth is to be expected, the ultimate ramifications of Trump’s tax reform reportedly could destabilize the global economy. Christine Lagarde, the IMF chief, had this to say on the matter: :“Having growth is good, improving productivity is good, but [policymakers should] make sure that the results of that growth are properly allocated.” She added that not only will the tax cuts lead to financial instability and inequality but also that it may very well lead to a lack of international cooperation moving forward. Though the stock markets hit record highs recently during the week, the currency market and the dollar were sent into turmoil after US secretary Steven Mnuchin’s comments on a weak dollar being good for US trade. Mnuchin and Lagarde spoke not only of the global economics as it related to the shifting market caused by tax reform but also of the sudden emergence of cryptocurrency in financial systems. Shaping the evolution of industry ecosystems and business models in the context of technology and policy transformation and gearing towards the Fourth Industrial Revolution was yet another key aspect of the conference. Just as the Third Industrial Revolution built upon electronics and information technology, so does the Fourth expand on a fusion of technologies blurring the lines of physical, digital, and biological spheres. From artificial intelligence to cryptocurrency, the wave of transformative technological knowledge is reflected especially in the fields of production, management, and governance. Overwhelmingly, the consensus at Davos on the subject was to take a cautionary tone. Mnuchin as well as Lagarde claimed that the primary focus on cryptocurrency should be that they are not used for illicit activities. Lagarde added, “There is anonymity and a lack of transparency in the way in which it conceals and protects money laundering and financing of terrorism.“ Regulation of blockchain technology clearly emerged as the primary concern before cryptocurrency, as world leaders acknowledged, would become systemically important in the global economy. Though Nobel Prize-winning economist Robert Shiller claims currency like Bitcoin could be around for 100 years, he added that it is much more likely to collapse. Despite rising criticism, the potential of the developing blockchain technology was clearly understood. 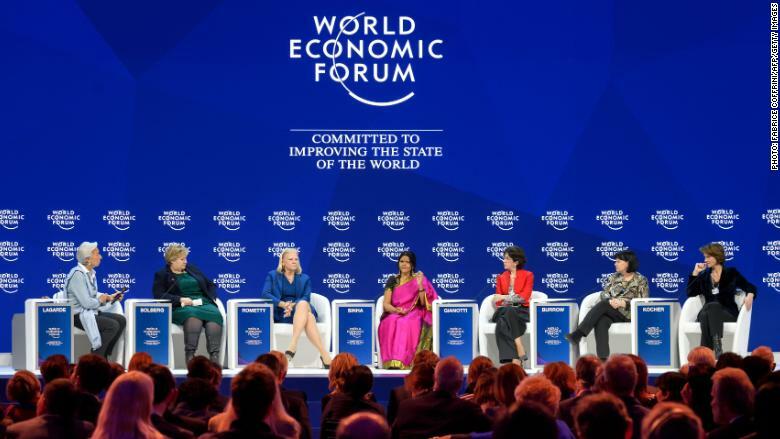 All-female panel at Davos 2018. || CNN. Just as world leaders and policymakers had gathered together to discuss issues surrounding economic financial systems and the global trading landscape, so too did they focus on the controversial issues that dominated the year in women’s rights movements #MeToo and Time’s Up. For the first time in the history of the annual World Economic Forum meetings there was an all-female panel of co-chairs. Though the audience in attendance was predominantly male, the forum’s seven female co-chairs made a statement that gender inequality was a serious issue that would no longer be tolerated by the non-profit. Lagarde aptly summarized the resounding approvement of the action with the quote; “Finally a real panel, not a ‘manel’.” Though challenges obviously remain for women in the the corporate world, this act was a step towards realizing the problem and approaching solutions. A significant speaker on the subject who came forward, Malala Yousafzai, added that the education of young men on the subject of women’s rights was quite simply a crucial step to ending gender inequality. To quote, “When we talk about feminism and women’s rights, we’re actually addressing men.” The core message of her speech revolved around the idea that education was essential to solving the current issues that are faced in today’s world. In resolving the problem, men must be taught to recognize that all women, and in fact all individuals around them, have equal rights. She ended by saying that in order for change to materialize, men must actively acknowledge that they are a large part of the movement for equality, whether this be workplace or income inequality. According to Oxfam, eighty-two percent of world wealth generated last year went to the richest 1% of the global population. Winnie Byanyima, a member of Oxfam and a co-chair on the forum panel, made it clear that income inequality hit women harder than anyone. Aside from the women who have made statements are Canadian Prime Minister Justin Trudeau and Chinese retail giant CEO Jack Ma. Both Trudeau and Ma have shared the sentiment that hiring women was not only the right or “nice” thing to do, but the smart thing to do. In summary, the annual meeting tackled issues of both the development in financial ecosystems and the cultural significance of achieving universal gender equality. While for the most part issues were merely discussed and not entirely met with full resolutions, the ideas and conclusions reached objectively have an effect on the outcome of 2018, as a result of universally reshaped global, economic, and future agendas.